Mechanical 360 Air Conditioning and Heating LLC specialize in installing, servicing and maintaining your air conditioning and heating system. We offer both Commercial and Residential AC services including new construction, repairs, installation, and remodeling. We service Houston and surrounding areas including Conroe, The Woodlands, Spring, Katy, Sugarland, Kingwood, etc. With professional services offered 24 hours a day by highly trained technicians, find out why more and more people are turning to Mechanical 360. Contact us today for a free estimate. We look forward to being your AC specialists. We know that the time is more valuable than the money and customer satisfaction means a lot to us. Mechanical 360 responds to our customers with promptness and we keep our customers updated on every development. Please take a look at testimonials. With decades of combined Air Conditioning and Heating expertise and some high profile clients on our books, we offer an unmatched understanding of our field. With Mechanical 360, you’ll get the best possible results for your money. Our clients are the most important thing to us. We build our business connections on honesty and integrity. We actively seek the best possible financial solutions for our clients, often going far beyond the traditional means of customer service. We work around the clock to make sure our customers are satisfied. If you have an outage do not hesitate to call Mechanical 360 for your immediate service needs. Our staff is professional and responsive. My experience with Mechanical 360 has been great. From day one, the customer service has been excellent. I get quick responses, and if a unit goes down, Mech. 360 has always come out the same day and get the units running again. 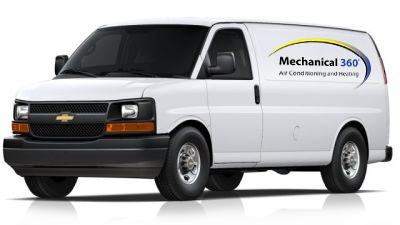 Our technicians at Mechanical 360 LLC are thorough, responsive, and have a top priority of getting your AC & Heating system running top notch again. Give us a try and you will be happy you did. by ~ Nathan Finke - Tech.